While most thank you donation thank you notes are written with from the heart, not all are equal with regard to how they engage supporters. That is, you have to ensure your thank you note evokes and reinforces the passion and emotion that drove someone to donate to you in the first place, while also thanking them for their dedication. Form letters and templates can help you, but you have to pay close attention to several aspects that help make a good thank you note. That’s because donors know you send a high volume of messages each year, so you’ve got to stick out among the noise. Show your supporters that their help matters, and that you truly appreciate it. Below, we’ll walk you through the components of a quality thank you that influences donors to continue supporting you into the future. One of the most important things about saying “thank you” is timing: it should be done promptly after a gift is made. Don’t make donors wait to hear from you or they may write you off before your message even arrives. When someone makes an online donation, you have an opportunity to respond with a two-step process. First, send a thank you email that includes a short message and their gift receipt. This can provide immediate gratification for donors, and let them know their gift has been received, processed, and acknowledged. What’s more, you can automate these messages through Classy. Shortly after the first email goes out, send a second thank you message. Ideally, this would arrive within 48 to 72 hours after the donation is processed. You can use either email or direct mail with this approach, but it’s important to remember that direct mail will take longer to arrive and can potentially cost more. The question of whether to send your thank you by email or direct mail can be a difficult one for nonprofits. On one hand, email messages drove 28 percent of all online revenue in 2017. Further, 73 percent of consumers prefer to be engaged via email. At the same time, this expectation could make a handwritten or printed letter stand out that much more to your donors. Direct mail also has a response rate of around 5 percent. There are still some potential downsides. For example, your letter could be accidentally thrown out with junk mail, or you could have to spend more money on postage now that the prices have increased. For the majority of your donation thank you letters, email will likely be the most practice and cost-effective method. However, if you’re truly torn between the two methods, it can be a good idea to survey your donors and ask how they prefer to be engaged. As you go, keep in mind that large gifts should be acknowledged with more personal methods, like handwritten notes. If you don’t have the time to write these notes, never forget that you can also call someone on the phone and thank them. When it comes time to write your letter you have to say something more than just “thank you.” This is an opportunity to position your donors as the hero of the story, not your nonprofit. First and foremost, celebrate what this person did and what they’re helping you accomplish. Highlighting the impact of their gift makes everything instantly more tangible: they can see and feel the real world implication of supporting you. 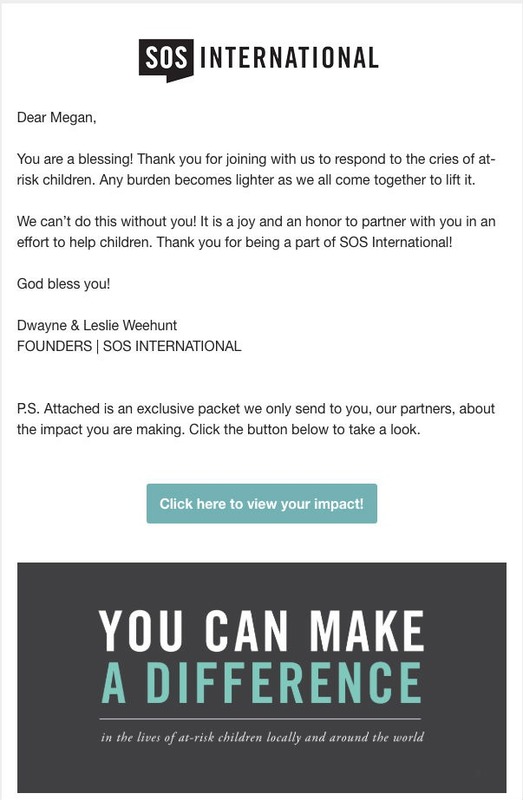 Beyond who they’re helping, you should also tell your donors how their gift will be used. For example, if someone donated to a campaign to rebuild a library, you could talk about how this facility will be improved, and then give some details on when it will be completed and what it will feature. Finally, never forget to plainly state your gratitude. It’s a simple rule, but can be easily overlooked. A good rule of thumb is to start by thanking them first, and end by restating your appreciation. It’s only what you say; it’s how you say it. While your appeals may benefit from tones of sympathy or urgency, a thank you letter should have a very different feel. Thank you letters are meant, in large part, to make the donor feel good about their decision and to show that their contribution is making a difference. This is why thank you letters should have a positive, can-do tone. While you can still note the urgency or seriousness of your cause, this message should be one of hope and action. Of course there’s more to be done, but this letter is about their gift and how it helps. It can diminish the positive tone of your letter if you use this thank you to ask for another gift. This is not the time or place to send out another appeal. Stick to your focus here: celebrate your donors, the heroes of your story, for the work they’ve already done. Confirmation emails and receipts come from an organization. Thank you letters come from human beings. Donors know that their gift is going to an organization, but that doesn’t mean they don’t want the personal touch of a message from a real person. Make sure that each thank you letter is signed with the name of a specific staff member, such as the development director or executive director. If you’re using email, make sure the staff member’s name shows up next to the subject line. Nonprofits should also include a staff member’s contact information in the letter. Most people won’t actually call or email, but including this information shows that you value their thoughts and want an open line of communication with donors. It is not enough to simply go through the motions when writing your thank you letters. Examine your messages and ask yourself, “Does this make the donor feel anything?” If the answer is “no,” it may be time to revamp your thank you processes. Make sure to download our guide below, 9 Email Templates to Engage Donors Year-Round, to help as you continue with your thank yous and donor touch points throughout the year.